Reflective meters on a camera set a exposure so that the overall tone of the subject appears at middle gray (18%). When the subject has an overall tone that is lighter than middle gray, the photograph will appear too dark. When the subject has an overall tone that is darker than middle gray, the photograph will appear too light. There is a 5-stop range of recognizable tonality. Detail-less black is 2½ stops darker than middle tone and detail-less white is 2½ lighter than middle tone. 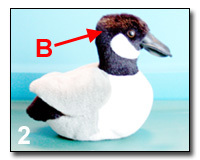 When the overall tone of the the subject is middle gray (18%), the reflective meter will set the correct exposure and the photograph will appear to have the correct exposure. Once you recognize what tone the reflective meter is setting the exposure to, you will be able to make the correct compensations. Compensations can be controlled by the aperture, the shutter-speed or the compensation dial. The following shows examples of different exposures based on what the meter appears to see. Photograph 1: This photograph was underexposed since the reflective meter set the exposure based on the tone in section A of the photograph. If your meter is going to record your subject too dark or you are compensating for a bright-toned subject (section A), you must add light. Photograph 2: This photograph was overexposed since the reflective meter set the exposure based on the tone in section B of the photograph. If your meter is going to record your subject too light or you are compensating for a dark-toned subject (section C), you must subtract light. Photograph 3: This photograph was exposed correctly since the reflective meter set the exposure based on the tone in section C of the photograph. The 3 Questions For Correct Exposure. 1) What tone is my camera metering? The three possible answers to this question are: lighter than middle tone, middle tone or darker than middle tone. 2) What tone is my camera recording? The answer is that because all reflective meters are calibrated to 18%, they will record your subject as 18% (middle tone). 3) What tone do I want the camera to record? The answer will probably be the tone that your camera is metering. If your camera is not metering a middle tone, you have to compensate with the shutter-speed, the aperture or the compensation adjustment. The sooner you can identify what tone you are seeing and what relationship the tone is to middle tone, the easier it will be for you to photograph with the correct exposure. You are going out into the winter with a foot of snow on the ground. What tone is my camera metering? Lighter than middle tone. What tone is my camera recording? Middle tone. What tone do I want my camera to record? Lighter than middle tone. If my camera is recording middle tone and I want my camera to record a lighter than middle tone, I have compensate by adding more light to the exposure. You are walking on a old lava field in Maui. What tone is my camera metering? Darker than middle tone. What tone is my camera recording? Middle tone. What tone do I want my camera to record? Darker than middle tone. If my camera is recording middle tone and I want my camera to record a darker than middle tone, I have compensate by subtracting light to the exposure. Photograph 1: What tone is my camera metering? Lighter than middle tone (Duck's white feathers). What tone is my camera recording? Middle tone. What tone do I want my camera to record? Lighter than middle tone. 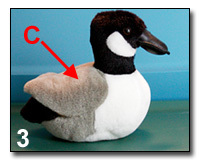 If my camera is recording middle tone and I want my camera to record a lighter than middle tone, I have compensate by adding more light to the exposure or the duck's white feathers will appear grey. Photograph 2: What tone is my camera metering? Darker than middle tone (Duck's black feathers). What tone is my camera recording? Middle tone. What tone do I want my camera to record? Darker than middle tone. 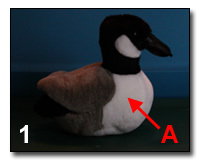 If my camera is recording middle tone and I want my camera to record a darker than middle tone, I have compensate by subtracting light to the exposure or the duck's black feathers will appear grey.